After two days of travelling in a row, 12 hours from Siem Reap to Bangkok (in low standard buses), an afternoon in Bangkok and another 12 hours by bus and ferry (Lomprayah, a company which runs transport between Bangkok and the islands in the Gulf of Thailand is really to be recommended!) 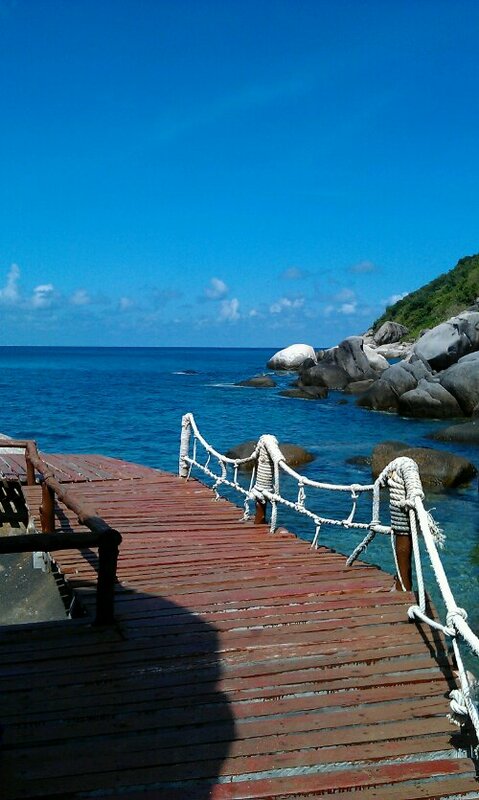 we arrived in Koh Tao yesterday morning. The place where we are staying on the most southern bay is nice but not as charming as in Koh Chang. But on our way here on the ferry I had seen a beautiful but obviously expensive resort. So today we took a scooter (best and most common way to explore an island. Walking somewhere is so yesterday in Thailand. Everyone always stares at us when we do because Thais seem to drive everywhere). We drove up the about 7km to the nothern end of the island and see, the resort I had seen had a public beach. Of course we followed the signs and ended up on wooden planks through the stone that are here everywhere. And underneath our bare feet was a sea so clear, with lots of fishes and so we couldn’t help but jump in. There was no actually no beach, but the water was just amazing and cooling off a bit in the definitively not so cold sea was delicious, especially as some Spaniards who had just come out of the water lend us their snorkeling gear. Now we’ll be drying up a bit and then venture on to see more of tiny Koh Tao. 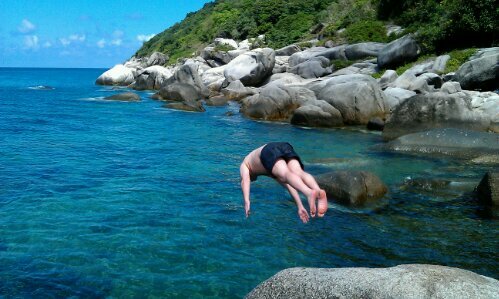 This entry was posted in Thailand and tagged Beach, Koh Tao, Summer by kathatravelling. Bookmark the permalink.